Ananya Mai Secondlife blog « My name is Ananya Mai..
Deesses will debut at The Gacha Mania! This place is so surreal and stunning. I don’t want to leave…… this music has captured my soul and the beauty of this architecture is magnificent. A sight to behold. #TheMeshProject (BETA) Deluxe Body(f) @The Mesh Project. #TheMeshProject (BETA) Head(f) – Fierce (Deluxe) @The Mesh Project. #TheMeshProject (BETA) Deluxe Feet(f) Bare/Low/Mid/High/Ouch! @The Mesh Project. Ok so like have been gone a while. Can’t expect technologies to freeze of course. But I came back to MESH HANDS AND AND SKIN APPLIERS!!! Ok ok Im slow off the mark but I’ve been in a rl cave and I am just stupid excited. I always sucked at matching skins to feet, hands, ears, heels and yeah get the drift. Now I put on an applier and like magic ITS PERFECT MATCHED!!! I don’t know who came up with this idea first BUT all I know is that Slink has it! I went in and grabbed the fatty pack. Love love love! I also heard there are mesh heads around?!! omgggggg right now I wish I could make one of those!! Anyways, so I am blogging about these mesh hands and I am guessing many of you would be like “yeah tell me something new?” however it is new to me and it is AWESOME. If you have been in a rl cave and never heard of it before, I strongly recommending giving it a go. Its alot of fun. Who you love is your business, seriously. My beautiful and talented sissy took these photos for me. I dont know how she does it. She has a success business, show producer, full time friend and has a jam packed rl as well. She is just a giving machine. We met just over a year ago and she never ceases to amaze me and I thank the universe for allowing our paths to cross. I wore a couple of these outfits when I modelled BOSL TOW fashion show and had to show them off here. The beautiful designers of SL came together and created some amazing exclusives for this amazing event. I am a proud supporter of this event. I have to admit it saddens me that it has to be said, because who you choose to love is your bloody choice. Its no one elses business seriously. Oh oh to the designers that dropped items on me please please message me the names of the outfits! I searched tow but my inventory has exploded on me. Being out of world has put me in a right state! DIFFERENT FROM ME, BUT MY EQUAL. 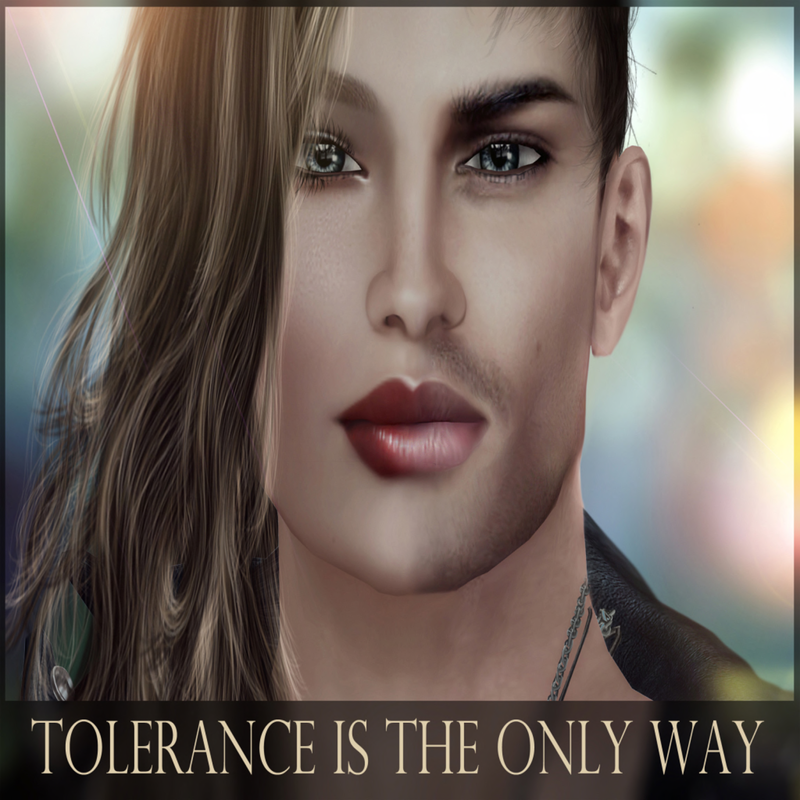 “Tolerance is the only way“Fundraising events on behalf of Tolerance, Equality and Respect. This event brings designers from all over the grid together to show there best designs.